You are currently browsing the archives for the tag 'embellished collars'. This winter, there is only one way to wear your crisp white shirt: buttoned-up to the very top. The wheel of fashion is always turning. On the runways, there were lots of masculine references, the season is all about the suits. Designers are paying tribute to the working girls and to keep things demure, no more cleavage is shown. But no worries, combined with a cool pair of shorts, the look is more about sophisticated minimalism instead of looking all prude. 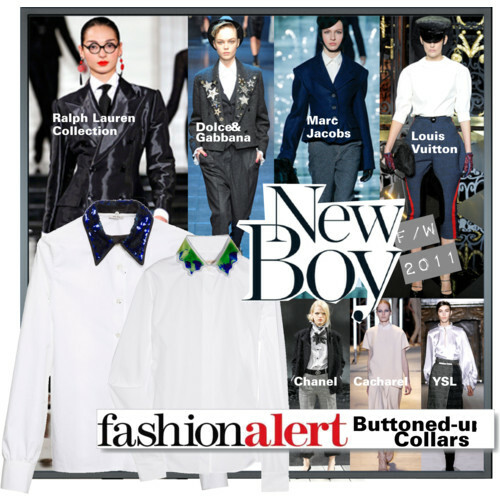 My favourites are the shirts with embellished collars (Miu Miu and Christopher Kane) that are now in stores.